Lots of memories attached to that dress! And evidence suggests its not cursed so, hey, pass it on! I love hearing about your trip through life. I am glad you have a great husband now. so glad that Lynn introduced me to your books. I am thinking of going to Tucson in May. I can’t get the dress photo to show. I assume that is what is in the box at the end of your message. I think you certainly got your money’s worth. Hello Carolyn Ann, try again, the photo is working now. Thanks. It is working for me now. I think it is great it has been worn by so many of you. I didn’t wear a long white gown for my wedding, but made a two-pieced dress of medium blue. I kept it for years and finally gave it to the Salvation Army—after I cut the buttons off! In 2010 the historical society museum where I volunteer had a wedding dress event. We had many wedding dresses loaned to us, including a mini dress and an embroidered hippie dress, and we found teenagers to model them. One woman could still wear her own, and it was actually her 51st wedding anniversary that day. She told the story of her dress, which was first her sister’s, then hers, a few years later a friend’s, and a few weeks after that it was rescued from a burning house. The dress survived to be worn by the daughters of the first 2 sisters who wore it, with a new veil created by Lucille. So that made for a wonderful story, and after the program, she donated her dress to the museum. I enjoyed your blog as always. I also could not find the photo and I would certainly love to see it! I’ve been lucky enough to be at two of your talks and loved them. I encourage everyone who can to go to one! Hello – try again the photo is working now. Your $130 dollar dress according to the CPI inflation calculator would cost almost $1000 in todays dollars. Still a good deal in it was worn 3 times! A beautiful dress with stories to tell and stories already told!! Thank you J. A. Jance for all the stories you have shared!! I’ve read them all……..some more than once…..Please never stop writing……….fact and fiction!! My favorite is the Joanne Brady books!! No wonder we love you!! We’ve got many of the same memories! My wedding dress was also shared again and again, and everyone was grateful. Thanks for sharing! Love reading your books and your weekly blog, I look forward to you writing about your life and experiences and brings back memories of mine. 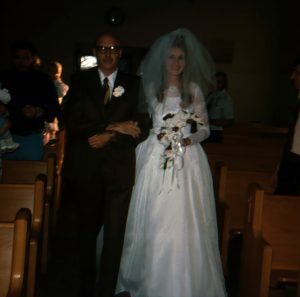 I didn’t have a traditional wedding dress when we married in 1970, I had what was called a pant suit but dressy, the top could be worn without the pants because the dresses were short then but I wore the pants and my maid of honor made herself one similar, mine was aqua and hers was lime green, my colors that day. I still have the outfit and may or may not fit in it. A very stylish dress that is timeless. I remember Arlin very well – we were in DeMolay together. He is a great guy and I am glad his marriage has lasted this long. Sue and I didn’t get it right the first time, but we have been married 20 years now, and are going strong. Hope to see you while you are in the Valley of the Sun. My wedding dress cost $25–got it at a bridal shop in the University District here in Seattle in 1966. Summer wedding and it was a long-sleeve brocade dress. Not what you would wear for a summer wedding, BUT it was on sale and I could afford it. We’ve been married 53 years this June. Love your stories. What a beautiful family story. I love all of the stories about wedding dresses. Looking at the photo again I see your gown has long sleeves and a high neckline. So much nicer than the strapless gowns brides ten to wear now. My mom purchased my first wedding dress at Peoria Dry Goods Store in Peoria, Illinois. It was not floor length, but very beautiful white taffeta with, covered over with lace. Three quarter length sleeves and I was thrilled with it. My family was very poor so I now this was such a luxury for my parents to buy. My husband tore it off of me that night. Not in a rush of love & lust, but in a show of power! The man had treated me like a queen until our wedding night. It was the beginning of years of abuse. No way I can explain it to anyone seeing this. I still have pictures of the dress. After many years I was rescued by my second husband and my wedding dress was just a nice sleveless dress with a jacket. I still have it. That wonderful man died in 2000, but shortly afterward I met Frank and I wore another street length white dress which I will always cherish. My life is so fabulous now that it’s hard for even me to think about all I went through. I am so blessed now with my Frank. I married in my US Navy Dress White uniform in 1969 and was so very proud because we had been told when they had issued us our uniforms at Boot Camp that they had originally been designed in Paris. My husband was in his Dress Blue “Cracker Jack” uniform and there we were, at the NTC San Diego Chapel … the perfect picture of “love eternal.” Or so I thought. He would soon be off on a ship bound for the Gulf of Tonkin off the coast of Viet Nam and unbeknownst to me, I would be headed to Nebraska to stay with his family because I would soon receive an Honorable Discharge when I did the ghastly thing of getting pregnant … definitely against regulations at that time. Seven years later, divorced (my husband’s drinking endangered not only myself but also my children), with both children in tow, I was Recalled back to Active Duty in the US Navy and was able to enjoy a 30-year career. (Thank goodness they changed the regulations regarding women with families.) None-the-less, I still recall that Spring day in San Diego when I stood there, so young and naïve. I thought I had the world by the tail in that “Paris designed” white uniform. What was I thinking?? My maternal grandparents eloped in 1920, taking the passenger train for the Sandhills of Nebraska to Denver. Her dress was a navy blue wool traveling dress, with the cutest little “cape” from the collar. It also featured navy blue buttons on each aide of the dress. Grandma wore a cloche hat with the suit. I still have the dress, in immaculate condition. Not your usual wedding dress, but quite elegant. Many hopes and dreams are worn with the dress.